The Cool It project helps councils improve community resilience to increasing heat in regional Victoria. Funded by the Department of Environment, Land, Water and Planning (DELWP), the project is a partnership between the CVGA and 8 partner councils (see below). Provide a proof of concept for a simplified methodology that utilises existing and publicly available data to determine areas where social vulnerability and heat exposure overlap that other Councils can also implement without the need to acquire expensive thermal imagery or other datasets. 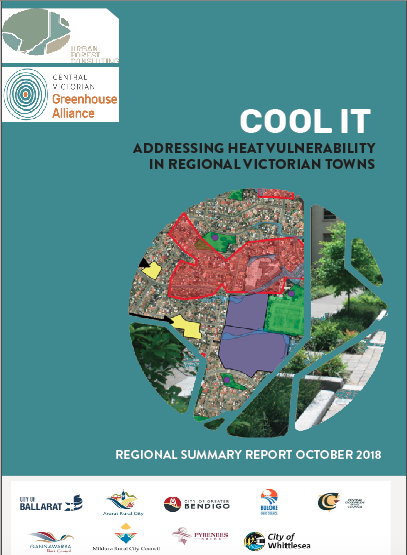 ​The Cool it project used existing spatial data to determine urban areas of 9 Victorian regional and rural Councils that were socially vulnerable to heat impacts. 2016 Census data, Victorian Government data, open data and aerial imagery were used to i) identify parcels of urban areas where populations are most vulnerable to urban heat and heatwaves, and ii) prioritise those parcels of urban areas that are also exposed to more heat due to a combination of high pedestrian activity and hot urban surfaces. Urban Forest Consultants and the University of Melbourne were appointed to develop the proof of concept methodology. The methodology is suitable for smaller shires and rural cities to use existing and freely available datasets to identify focus areas. Given Council resource constraints, it is critical that Council can identify where to prioritise urban cooling interventions such as new tree plantings or permeable pavements. It is important that investments in heat mitigation maximise benefits to the most vulnerable sectors in the community in a cost effective way. where to position "shady walkways and cycle ways"
The final regional summary report is available here. Individual action plans are available upon request.